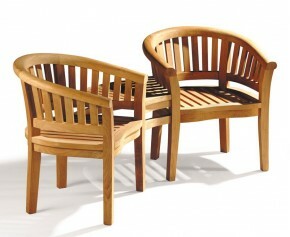 With their iconic, modern design, our Contemporary garden benches will be a charming addition to any outdoor space. Featuring a graceful curved rail, our Contemporary garden benches offer elegant style and comfortable, ample seating for you and your guests. Made from the finest grade-A teak, our Contemporary garden benches can withstand any weather condition and can remain outdoors all year round for minimal fuss. 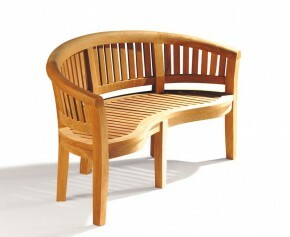 This Teak Banana Bench sometimes referred to as a peanut bench or crescent bench because of its gently undulating design, features a curved top rail and a level seat - making it perfect for relaxing on during long hours spent in the garden. 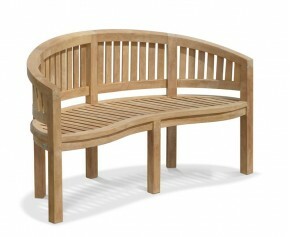 Hand crafted to the highest spec in grade-A teak, this deluxe teak banana bench otherwise known as a peanut bench because of its smoothly undulating design is stylish, solid and makes a great focal point in any garden or outdoor space. 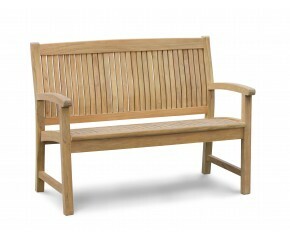 This Bali 2 seater teak garden bench is constructed from durable, sustainable A-grade teak for long life and great looks. 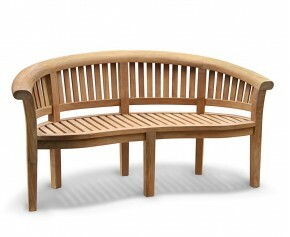 Designed to stand the test of time, this low-maintenance bench can remain outdoors all year round. Extremely durable without compromising on comfort, our Contemporary garden benches are sure to bring you long lasting fruitful use for years to come. With a selection of sizes and styles, you are sure to find Contemporary garden benches that are perfect for your particular outdoor space.